Boluda Corporación Marítima’s towage division Boluda Towage and Salvage has added a new azimuth tractor tugboat in the port of Las Palmas de Gran Canaria. The VB TAMARAN joins ten other tugs operating in the Canarian port to facilitate ships’ entry and exit from the port area. 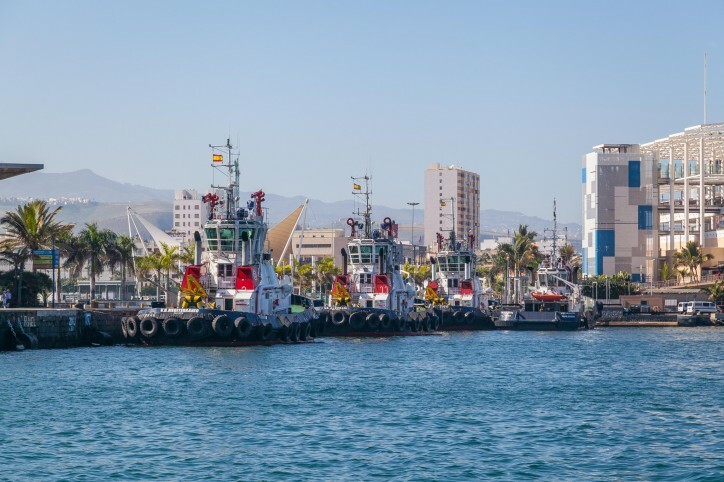 Caption: Three tugboats of the Boluda Towage and Salvage fleet in the port of Las Palmas, where the VB TAMARAN will be added once painting is completed. With this new tug, Boluda Corporación Marítima has expanded the fleet in the port of Las Palmas to ensure maritime safety in the Canary archipelago. The investment is in line with the company’s commitment to increase the operational capacity of vessels providing towage and marine salvage services. The VB TAMARAN, 29.50m long and 11m beam, runs on 6,436 hp with a 76.75-ton bollard pull, making this new Boluda Towage and Salvage tugboat the most powerful vessel in the multinational fleet of Las Palmas port. The VB TAMARAN’s technical specifications also include an oil recovery service to collect spills and hydrocarbon discharges from sea water. Boluda Towage and Salvage is the only private company to provide this service in the Canary Islands. Other tugs in the Boluda Towage and Salvage Las Palmas port fleet, aside from the VB TAMARAN, are the VB ALBORAN, VB MEDITERRANEO, VB BALEAR, VB ADRIATICO, VB BRANDY, VB ASTERIX, VB OBELIX, VB SOLEA, DON QUIJOTE I and DON QUIJOTE II. Together with the other vessels in the Canary Islands they make up a fleet of 19 tugboats.